We have the return of George Geef, the every day man form of Goofy, in Tomorrow We Diet. There is nothing that we can relate to more than the struggles of dieting. I’m sure almost everyone reading this has been through it, and it becomes a part of suburban life. 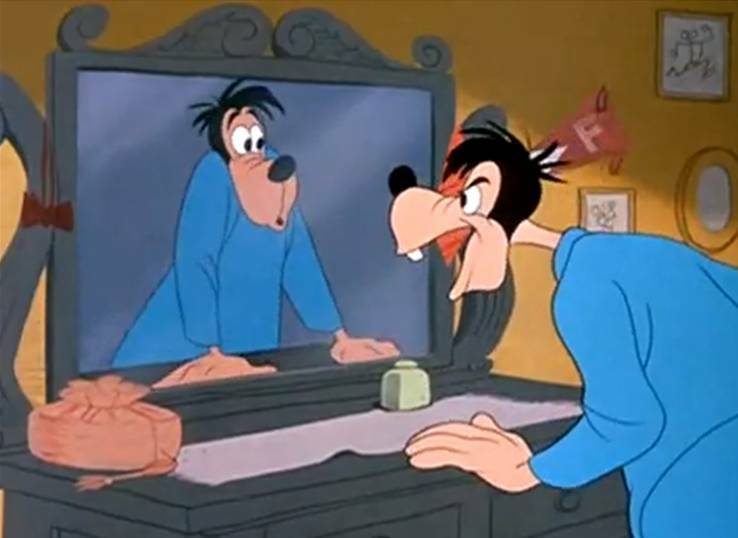 I’m sure many Disney animators had tried dieting at this point in their lives, and it ends up being one of the funniest of the George Geef shorts. 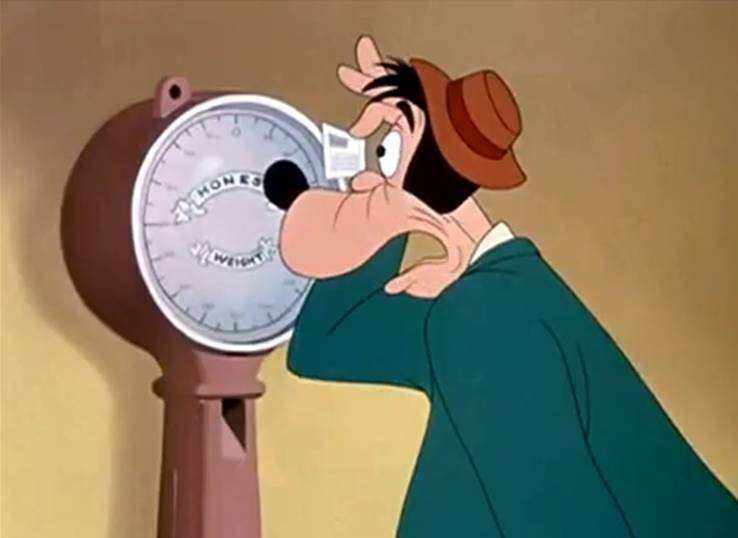 The Goof in this short does not look like the Goofy of old. He is more rotund around the middle, does not have his typical ears and hat, and is generally speaking more human like. When he walks in front of the mirror, that’s when the fun begins. The Geef in the mirror begins pointing out to the Geef in the real world that he is fat. The back and forth between the two is the basis for the rest of the short. It’s a good way to play off the trick of the omniscient narrator from the How To shorts. Despite the mirror’s protestations, it takes a strange turn of events for Geef to figure out that he really is overweight. The thought put into this sequence is astounding, because it builds throughout and ends in a perfect joke. Geef has to use the tarp from the tailor shop as a suit, causes a taxi to get flats and breaks an elevator because he’s so overweight, but it’s not until he steps on a novelty scale that he realizes there is a problem. It’s the little slip of paper with his fortune that gets Geef to realize the issue. That is hilarious. When he returns home and starts getting serious about the diet, it’s the man in the mirror who advises him. Again, it’s a brilliant twist. All of us have tried to lose weight and listen to the voice in our head when we do it. In this case, that voice is given dimension through the picture in the mirror. Just like our own internal voices, though, the Geef in the mirror doesn’t always give the best advice. He keeps saying that Geef should wait and not eat, forcing him to lock up the food. 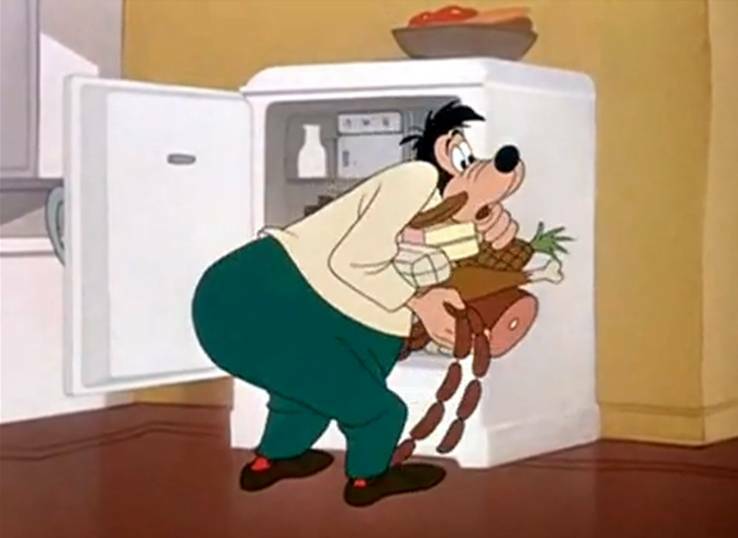 The struggle to not eat at night is one any dieter is familiar with, so watching Goofy go through it as he sees things turn into food all around him. 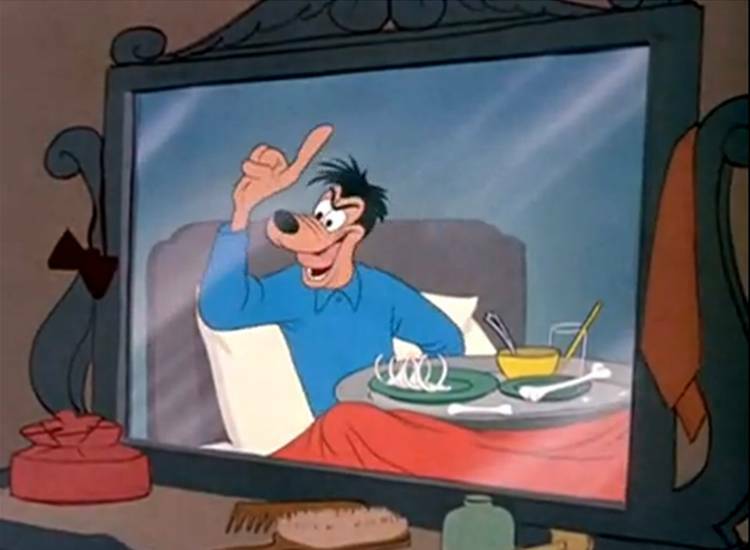 The artistry of the quick cuts from furniture, drapes and more turning into food and back to Goofy’s panicked face is amazing. The ultimate kicker is when Goofy finally gets to sleep, he is awakened by the man in the mirror eating all the food! It’s then that the immortal line, “Tomorrow we diet!” is spoken, summarizing the thoughts of all of us. That makes this short one that translates from a simple gag reel to a great relatable short for all of us.